Trigonometry Review Programs and Apps | Math Tutor Inc.
trigonometry review, drill, and practice academic software package. Parents seeking a homeschool trigonometry drill and practice instructional software program will find the program to be perfectly suited to their needs. And others who simply want interactive trigonometry practice and drill computer software designed for self study will find the program to be exactly what they were looking for. 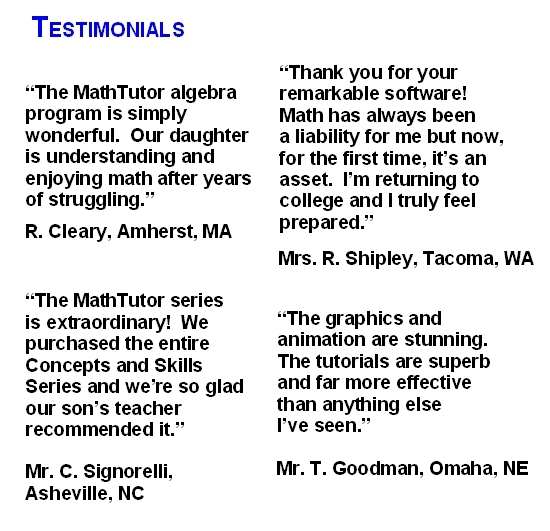 TRIGONOMETRY AND ADVANCED TOPICS has been acclaimed for its educational excellence as well as its flexibility. It can be used for self-study and to enhance classroom instruction in high school math classes. Designed by math educators and in accordance with math curriculum standards, the program provides interactive trigonometry drill and practice exercises suitable for students at all levels of ability. Examples and trigonometry problem solving exercises progress gradually from the simpler to the more challenging, allowing students to develop outstanding trigonometry problem solving skills. Identities: Angle Addition and Subtr.